This weekly update is a very difficult one for me to write. We were unable to put together a weekly update for last weekend because we were preparing to engage the legislature over their intent to run HB 2060, and potentially HB 2227. As you know, HB 2060 ostensibly dealt with domestic violence (PFA) issues while HB 2227 dealt with creation of a new section of law regarding extreme risk protection orders. Most, if not all, of you reading this have never been engaged in the kind of legislative battle that occurred beginning on Monday the 24th. Make no mistake about it, this legislative battle was a knockdown drag out fight between every gun control group in the country, Moms Demand Action, Every Town, Giffords Law Center, and Cease-Fire PA were determined to pass this legislation! This battle was initiated over the legislation above due to political/election issues and the speaker of the house representative Mike Turzai whose opponent in the upcoming general election, Emily Skopov (a Mom’s Demand Action-Gun Sense Candidate), ridiculed and derided him in a press release for not running HB 2060. This caused speaker Turzai to be outraged and to immediately schedule HB 2060 a vote this past week and damn the consequences. To remind you, both HB 2060 and HB 2227 were tabled in June due to the flaws in the bills and the constitutional concerns surrounding them. So, before I go any further, I want to ask you if you know or understand the issue of Ex Parte hearings? Do you believe that due process is important? Do you believe that laws should not put impossible burdens on the accused especially when they haven’t even had the opportunity to confront their accuser or have their day in court? If you said yes to the above then you have a good start in understanding why both of these bills are constitutionally repugnant and will lay the groundwork if passed for more onerous legislation to violate our right to bear arms and constitutional freedoms! We are losing our rights in the shadows where these anti-gun organizations are creating legislation and laws that set precedent for future abuses. As members of Firearms Owners against Crime you expect your officers to take the right position on issues that matter the opposition or consequences! We strive to do this every day! 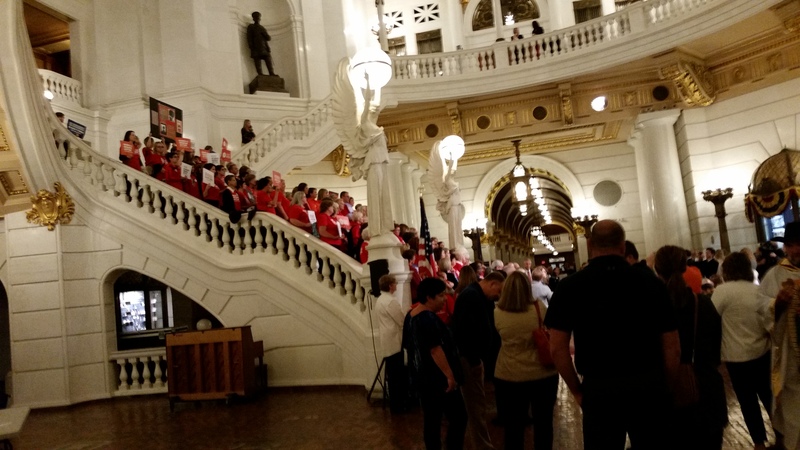 That is why over the weekend we did everything humanly possible to try to organize gunowners to physically go to Harrisburg and support us as well as to make phone calls and send emails to Pennsylvania House of Representatives members. The problem we have is that gun owners seem to have lost the will to fight or even to recognize the dangers of these kinds of laws! Why do I say that? The fact is is that I do 5 million gunowners in Pennsylvania and 1.17 million citizens with a license to carry we had a total of eight gunowners there in Harrisburg with five of them being FOAC members and three more being members of the Oath Keepers. The picture below is of our information table at our rally point and as you can see there are no gunowners around. SO IF YOU WERE AN ELECTED REPRESENTATIVE WHO WOULD YOU LISTEN TO????? There are many in the Second Amendment community that believe that there is no need for personal attendance at the few incidents like this where gun control raises its ugly head. However, that could not be further from the truth! The reason is that the anti-gun groups have realized that there is no substitute, not email or phone calls, for putting a living breathing human being in front of someone and advocating for their position! This past week has borne out that premise and has set the stage for the success of it with every other gun control measure that comes up! The new rules are that there are no rules. This isn’t an “honest and open debate,” evidence is merely someone’s policy preferences dressed up in “common sense,” and we don’t get brownie points for “reasonableness.” The objective is to win so hard that none of those things matter. We have a lot of work to do; if gun owners don’t ditch the apathy and false dichotomies, the irrational reliance on Trump-as-savior, and learn how the Constitution and government really works, California will be the model for the nation and not the laughingstock of it. So, what happened in Harrisburg this week? It quickly became apparent that chaos was going to reign because many legislators were upset that speaker Turzai was bringing this issue up and putting the entire caucus of Republicans at risk so close to an election on a controversial issue such as HB 2060! Many house members recognized and were concerned about the risks presented with the language in the legislation. However, and this is key, they felt intimidated by the Mom’s Demand Action activists who have been strutting around Harrisburg and disrupting the entire flow of the capital and legislation. This was not going to be a debate on the merits, or lack thereof, of legislation or even an honest attempt at fixing flaws in legislation so there were no unintentional consequences. Now this fight was going to be purely on emotion and who swung the bigger stick. Clearly, through lack of commitment, gunowners had drawn the short straw! Even with all of the anti-gun organizations and every law enforcement agency (except the Pennsylvania sheriffs but more on that later) in support of HB 2060, and with the NRA claiming to be neutral, the facts and the pro-gun house members were putting up a supreme battle. So much so that HB 2060 did not come up for a vote on Monday nor did it come up for a vote on Tuesday. We, FOAC, offered a compromise to leadership that would require opening up HB 2060 for amendments and doing what is known as “a gut and replace” with the language from Senate Bill 501 which was amended in the Pennsylvania Senate with language we approved of and then with a couple of technical amendments we would have been neutral on this. This is what we were promised in May and did not happen! In case you hear from legislators that both bills were the same that is a lie! There are subtle but significant differences between the two and anyone it says that has not read both bills and is simply obfuscating the fact that they don’t know what they’re talking about and that they are willing to take the mistakes in HB 2060 rather than do the right thing! There was such drama surrounding the deliberations on Monday Tuesday and Wednesday that it is almost impossible to put all of that in this report. 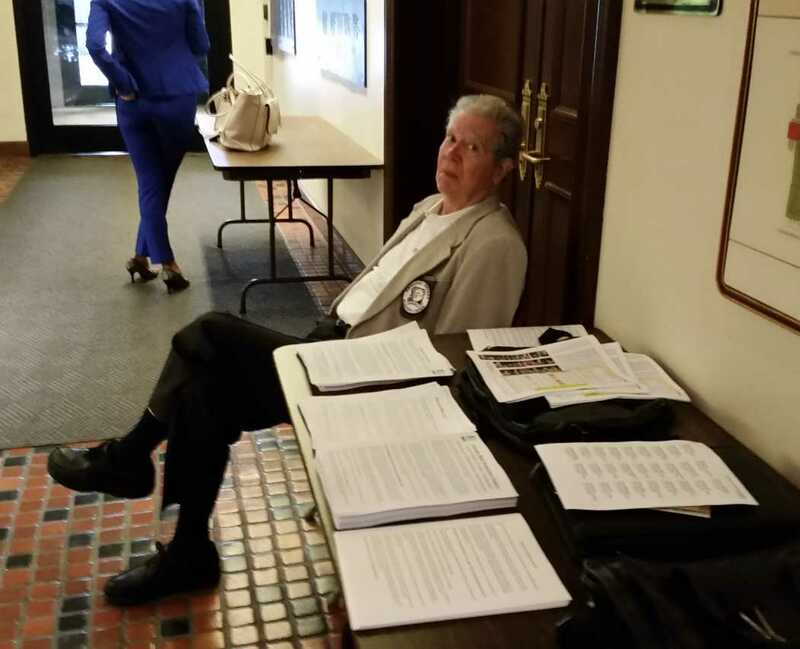 From speaker Turzai screaming at representative Daryl Metcalfe in the caucus meeting, as well as representative Rick Saccone, to the lies being spread about the Pennsylvania sheriffs Association supporting HB 2060 to the failure of the speaker to follow house rules (specifically rule 24) on motions made by members on the floor. Owners must evolve into the 21st century and stop allowing ourselves to be bullied by Millionaire monsters like Bloomberg and Soros! We need to put together a ready reaction force, special operations unit if you will, that can respond to these assaults on freedom with dedicated individuals who will take off a day of work and go with us to Harrisburg when necessary! This may happen once or twice a year and we have the numbers in Pennsylvania that can make it fair for everyone! Make no mistake about it though, failing to employ tactics that will properly counter what is being used against our legislators to support gun control will result in Pennsylvania slowly turning into Maryland, New Jersey, New York because right now my friends as far as advocacy goes we are getting our butts kicked! The final vote on HB 2060 was 131-62 with 54 Republicans and 8 Democrats voting against this bill. ANY House member who voted for HB 2060 has lost their FOAC endorsement and their grade has been reduced. Tomorrow, HB 2060 goes to the PA Senate for consideration through the ‘full’ process including committees. Senators should be ANGRY about the bait and switch with SB 501, which FOAC was neutral and worked on for 3 years. Kind of makes you wonder if something else was going on like maybe helping Rep. Quinn run for the 10th State Senate District open seat?? NAAAHHH, that couldn’t be it could it, could it? Keep your powder dry my friends, this story is still unfolding! ******This is the enemy Florida gun owners now face as many “A-rated” Republicans they supported betray them and flee. Is the above happening in Pennsylvania?? Ask Rep. Mike Turzai, who's running scared from a Mom's Demand Action - Gun Sense Candidate, Emily Skopov - his challenger in the upcoming General Election. Along the way, he's throwing PA Gun Owners under the bus! Those of us who are gun rights advocates and supporters often cite the data, and for a good reason — the data is overwhelmingly on our side, and the data shows the truth. We care about the facts and we want to make ethical, sound judgments based on the available data. We think it’s important that violent crime is down over the last 20 plus years, that gun crime and homicides are down over the same period and that while the United States makes up 4.5 percent of the population on earth, we’re accountable for only 3% of the mass shootings in the world. These things matter to us, and they should. They should matter to everyone, and yet, they don’t. Actress Alyssa Milano — who also recently employed armed guards outside of the National Rifle Association (NRA) convention in Dallas, Moms Demand Action and other groups appeal to fear and sadness. They act out Rahm Emmanuel’s famous, “don’t let any tragedy go to waste” political manifesto. To paraphrase Ryan Gresham from Gun Talk Media, it’s a bunch of middle-aged moms in government hearings crying, “but what about the children?” They know that data doesn’t compete with that, that emotion sways far more people than facts. They’re ignorant of guns. Therefore they’re scared of guns and if they’re afraid of guns, then their right to feel safe trumps our right to be safe. I’m not saying we should give up facts, not at all; I think we need to keep pushing that narrative and bringing the truth to the light, especially when it comes to the number of self-defense uses of firearms in America. However, I think we need to add an emotional component to our argument as well. We need to market people who have defended themselves and their families with firearms, especially women and minorities. The right to protect ourselves and our families is a human right, given to all of us no matter our race, gender, religion, orientation or any other thing the left wants us to put front and center to segregate ourselves. What is more important than protecting your very life and that of your family? If we have a right to “life, liberty and the pursuit of happiness” then our lives have to be the first thing we protect. That’s the anti-gunners’ argument, but it should be ours too. It’s up to us to frame that properly because they have skewed it so perversely. As a father, my number one priority in life is to protect my daughter, and I’ll do it at all costs, it’s my most sacred duty. To me, and most of us, this seems like the most basic of common sense. However, we need to frame this in a way that will resonate with the people who don’t own guns. If nothing else, we need their support. And hopefully, we can turn a lot of these individuals who support some gun control, but are not zealots, into law-abiding gun owners. So, then the question becomes, “how do we do it?” On a broad scale, I admit it’s going to take all of us to adapt to new methods. However, just like I say to gun owners all the time, on a one-on-one basis, we have opportunities to be advocates and ambassadors every single day with our friends, co-workers, neighbors or perhaps just the person on the bar stool next to you. While exact numbers are hard to come by, approximately at least one in three Americans own at least one firearm. This means teachers, Sunday School teachers, ministers, Cub Scout leaders, swim coaches and a little bit of everyone. There are excellent ambassadors for gun rights out there, everywhere. I know in today’s world of boycotts and social media outrage it’s risky to put yourself in the public eye, but if we don’t have some people stand up for what we believe in their communities, gun control activists are going to continue to try and strip us of our rights. They’re not going to do this all at once. Their plan of attack is obvious — death by a thousand cuts. It’s the capacity of the magazine, bump stocks, waiting periods and raising the age to buy a .22 LR rifle to twenty-one. It’s one little law at a time. Let’s keep pushing data-driven decision making, but let’s also start asking these people, “What about protecting my family? Why is it okay for you to live in gated communities with armed guards, but you think those of us who can’t afford that don’t deserve any protection at all?” We need to bring their hypocrisy to light. These are the same people who say “all cops are racist murderers” out of one side of their mouth while saying “only cops need guns” out of the other side. They’re fighting dirty because they know they’re out-manned and out-gunned. ALL we must do is wake up and get engaged in the debate! I’m not saying we sink all the way to their level, but perhaps it’s time to stop being so polite. It’s a death match, not an Ultimate Fighting Championship title fight.